Make yourself at home in one of the 77 air-conditioned rooms featuring flat-screen televisions. Complimentary wireless Internet access is available to keep you connected. Private bathrooms with showers feature complimentary toiletries and hair dryers. Conveniences include safes and desks, and housekeeping is provided daily. Stop by the hotel's restaurant, The Seasons, for lunch or dinner. Dining is also available at the coffee shop/café, and room service (during limited hours) is provided. Wrap up your day with a drink at the bar/lounge. Full breakfasts are available daily from 6:30 AM to 10:30 AM for a fee. This 123-room hotel sits at the heart of a large historic park with swimming pool, 875 yds (800 m) from the train station and just a few minutes from the city center. The hotel facilities include fitness center with gym, sauna, whirlpool bath and steam bath, indoor and outdoor car parks, à la carte restaurant and meeting and banqueting rooms. Complimentary services include WIFI, use of the car park, fitness center, and outdoor swimming pool during the summer. Take advantage of recreation opportunities such as a fitness center, or other amenities including complimentary wireless Internet access and concierge services. Additional amenities at this hotel include wedding services, a television in a common area, and a banquet hall. Featuring free WiFi throughout the property, B&B Baciami Ancora offers accommodation with a small flat-screen TV in Bari, 500 metres from the Petruzzelli Theatre. All rooms offer a private bathroom with a shower. A sweet Italian-style breakfast is available every day. Baciami Ancora B&B is located 1.5 km from the Basilica of Saint Nicholas and 4 km from Fiera del Levante. 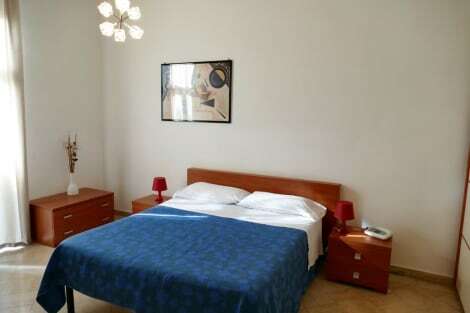 Bari Karol Wojtyła Airport is a 25-minute drive from the bed and breakfast. Make yourself at home in one of the 4 air-conditioned guestrooms. Rooms have private balconies. Prepare your meals in the shared/communal kitchen. Complimentary wireless Internet access is available to keep you connected. Bathrooms have showers and hair dryers. Take advantage of the bed & breakfast's 24-hour room service. For your convenience, a complimentary breakfast is served daily from 8 AM to 10 AM. With a stay at La Rosa Blu Bed & Breakfast, you'll be centrally located in Bari, within a 15-minute drive of Planetarium of Bari and Lido San Francesco. 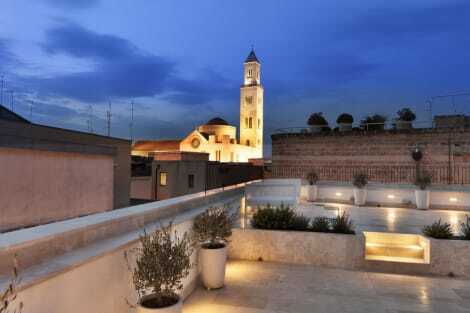 This bed & breakfast is 7.2 mi (11.5 km) from Bari Harbor and 7.6 mi (12.3 km) from Bari Cathedral. With a stay at Visa Residence, you'll be centrally located in Bari, within a 15-minute drive of Bari Harbor and Bari Cathedral. 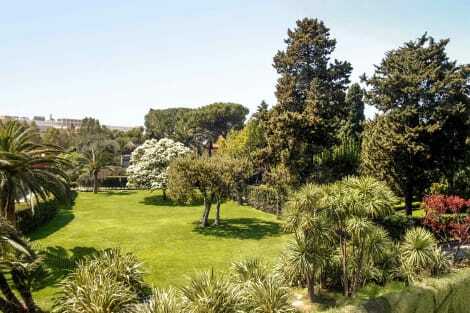 This residence is 0.7 mi (1.2 km) from Piazza Giuseppe Garibaldi and 0.8 mi (1.3 km) from Provincial Archaeological Museum. Bari is a bustling port city in Puglia, on the Adriatic coast of southern Italy. Situated on an important ancient maritime route, sailors and traders have been passing through Bari since ancient times. As a result, the city has a rich history and varied culture. Bari has been a strategic port since the Ancient Greeks ruled this part of Italy. A walk through the Old Town, Vecchia Bari, is essential for sightseers and those looking for a slice of the past. The labyrinthine streets are hard to navigate, so make sure you pick up a map from one of the many tourist information centres in the middle of town. Once in Vecchia Bari, embrace the sights and the sounds as old women gossip in doorways and the smell of fresh pasta wafts down alleyways. The main attraction in the Old Town is Bari's most beautiful church. Situated near the sea, the 11th-century Basilica di San Nicola is an architectural gem and a place of great religious significance. San Nicola, to whom the church is dedicated, is better known as Saint Nicholas or Santa Claus, and his remains lie in the church's crypt. His body is said to exude a holy oil and small vials of this miracle liquid can be bought in the church shop next door. After visiting the basilica, stroll down to the seafront for some restorative air. Once you're feeling refreshed, Bari's other famous church, and the city's cathedral, Cattedrale di San Sabino, is a short walk away. It too is an impressive Romanesque-style structure and well worth a visit. Round the corner is the Castello Svevo, Bari's imposing fortress built by the Normans to ward off potential naval invaders. It is important to remember when staying in Bari hotels that most of the city's monuments and buildings close during the early afternoon, when the sun is at its hottest. This is a perfect time to retreat back to your hotel for a siesta or take a refreshing dip in the sea. Bari's beaches aren't stunningly beautiful but the public beach at Lungomare Perrotti is clean and safe. A midday dip here is an invigorating endeavour. After a day spent meandering through Bari's narrow streets, you'll need some good restorative food. Next to the Old Town are two lovely squares, Piazza Mercantile and Piazza del Ferrarese, both of which are lined with bars, pizzerias and trattorias. Gianna's on Piazza Ferrarese has the best focaccia in southern Italy, while La Parilla de Juan serves up mouth-watering Mexican cuisine on Piazza Mercantile. After a spicy supper, grab a pistachio ice cream from Martinucci's. If the heat of the city gets too much, there are a number of lovely day trips you can take in the beautiful Puglian countryside. Just a short train ride away is the famous cave city at Matera. Once a squalid town it has been cleaned up and is now a UNESCO World Heritage Site. Hop on another train to reach Trani, a picturesque seaside town just along the coast from Bari. The town has a cathedral on a cliff just above the sea and from here you can watch the fishermen bring in their daily catch. Bari is not your typical Italian holiday destination but that is why it is so special. It's noisy, brash and at times a little chaotic, but for the adventurous traveller, the city has plenty to offer.